The operators of many of the riverboat casinos along the Mississippi and Ohio Rivers are likely to enjoy smooth sailing as growing demand, limited new supply, and relaxed regulations support stronger operating results and possibly rating upgrades, Moody's Investors Service reports. The rating agency also cautions, however, looser gaming restrictions in one jurisdiction or the strengthening of one casino's position through the addition of new amenities could put pressure on neighboring operations. "Overall, our rating outlook is positive and we expect more upgrades than downgrades of companies in this industry over the next 6-18 months," says Moody's VP/senior analyst Todd Gray. "But at the same time, the rising tide for the sector as a whole will not lift all the riverboat operators." Specifically, the analyst says among the companies in line for a potential rating upgrade or positive outlook change are Hollywood Casino Corporation (B3); Hollywood Park (Ba3); Horseshoe Gaming (Ba3); Lady Luck Gaming (B2); Hollywood Casino Shreveport (B3); Players International (Ba3); and Station Casinos (Ba2). Companies more likely to experience either a rating downgrade or a negative outlook change include Alliance Gaming (B2), Majestic Star (B2), Mirage Resorts (Baa2) and President Casinos (Caal). The analyst points out that many of these companies also operate land-based casinos, and that rating changes in any direction are also influenced by the performance of these other properties, as well as by management's financial and strategic policies overall. Since riverboat casinos first opened in Iowa in 1991, the operators of such casinos have seen demand grow faster than supply. This is likely to continue to be the case, especially as new regulations in Illinois, Missouri, and Louisiana either eliminate certain operating restrictions in an attempt to increase tax revenues from the casinos or eliminate a source of potential competition. For example, in Illinois, gaming revenues have increased dramatically since last June, when Governor George Ryan signed a law eliminating the cruising requirements on the state's nine riverboat operators. Prior to this law, the flow of customers was limited by the requirement that the riverboats set sail for a minimum of two-hour cruises. Following the change, revenues were up an average of 35 percent from July though December 1999 over the same period in 1998. And in Louisiana, two Baton Rouge casinos owned by Louisiana Casino Cruises (Bl) and Argosy Gaming (Ba3) have seen their revenues increase more than 20 percent since last summer's ban on video poker in non-casino locations, such as bars and truck stops. Louisiana Casino Cruises was upgraded in November to Bl from B2, in part because of these gains. In addition to more favorable regulation, "new amenities such as hotels, restaurants, improved parking, and entertainment facilities, are likely to attract new traffic, as well as increase the amount of money that the average customer spends per visit," according to Moody's Todd Gray. New competition is likely to remain limited either by the number of gaming licenses granted by some states or by the fact that many of the best locations for such facilities have already been taken, the analyst says. He also says more consolidation among the industry is likely as existing operators are afforded limited opportunities for growth as a result of the same factors. 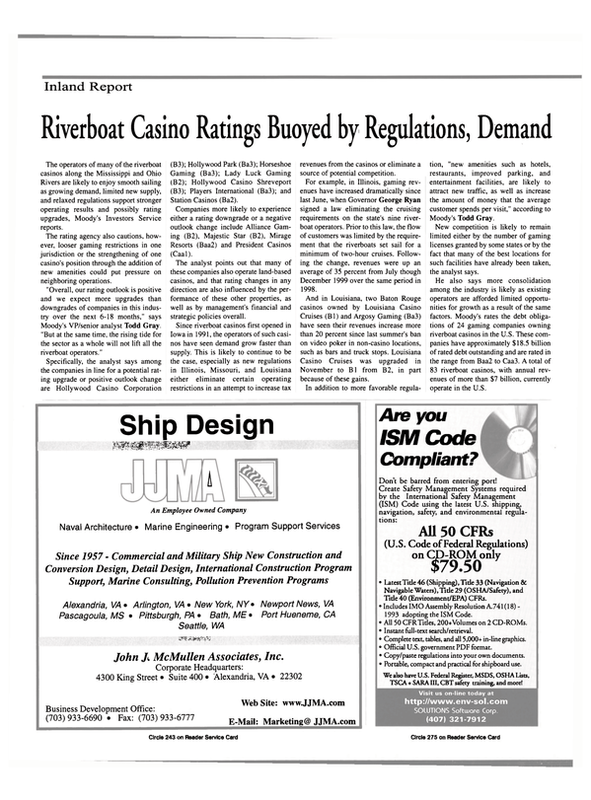 Moody's rates the debt obligations of 24 gaming companies owning riverboat casinos in the U.S. These companies have approximately $18.5 billion of rated debt outstanding and are rated in the range from Baa2 to Caa3. A total of 83 riverboat casinos, with annual revenues of more than $7 billion, currently operate in the U.S.